Paloma has always mucked about with Pijon. They love it. They run wild. They dress up. Like tigers, queens, and Lady Gaga. Everything. All of a sudden, Paloma comes face to face with a blinding light named Big Luce. Paloma doesn’t understand what she’s done wrong but Big Luz just won’t leave her be. Paloma and Pijon are catapulted into a surreal adventure, determined to find out what Big Luce is all about. 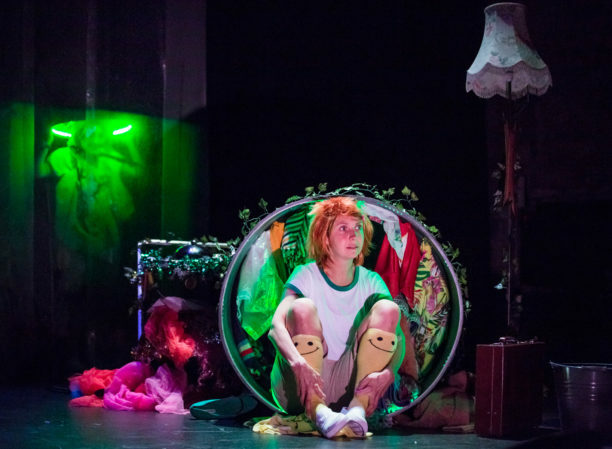 Created by award-winning theatre maker Caroline Horton, Muckers is a funny, magical, physical production for ages 5+. This mischievous show asks what it takes to stand proud and be true to ourselves.